The MBOX to EML converter software scans & ready file for preview in quick time. Select EML file from list given and then use option as per requirement. Browse location to save resultant file and then click on OK to proceed further. I have been using an email client for last two years. It runs smoothly but sometimes it's very difficult to work with it.These applications evolve much trouble in opening Mailbox. Due to which I am unable to perform the normal emailing & suffered a lot. I have decided to go with other email client platform with all of my file & data. Can I transfer complete MBOX mailbox to EML? Does Software provide search option to find lost emails? Is there any option to exclude duplicates emails? Can I recover deleted emails also? Is there any need of the external application to run software? Does MBOX to EML Converter maintain folder hierarchy? There are no quick tricks to convert the MBOX to EML. 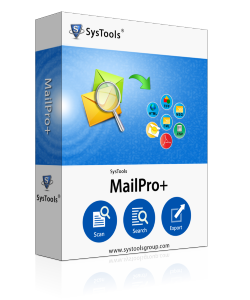 For this, you require MBOX Mailbox to EML converter which is professionally built for this purpose only.It provides various awesome features such as Advanced Powerful Search Option, Flexibility to save the search Result, excludes duplicates emails, Maintains Folder Hierarchy and much more like this. Using this software you can convert mbox to eml in batch. The MBOX to EML Converter only converts, it does not recover deleted emails and there is no need of any external application to run MBOX to EML Converter. Is there any option to add all MBOX files at once to the software? Will this software work on Windows 10 machine? Yes. MBOX Mailbox to EML Conversion Tool is capable to work on all versions of Windows and works well on Windows 10. Is this Export MBOX Mailbox to EML software capable to convert attachments of emails? Yes. Convert MBOX to EML tool will successfully convert attachments of MBOX emails to EML files, which can be accessed after conversion. How to search individual EML email followed by conversion? 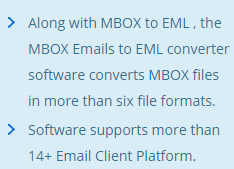 MBOX Mailbox to EML Converter Tool provides an option to save the EML files with different naming conventions. This makes easy to search the emails saved as EML files.